Time to start thinking about...Valentine's Day! Now that the Christmas holidays are over, it's time to start decorating and thinking of gifts for the next event!! 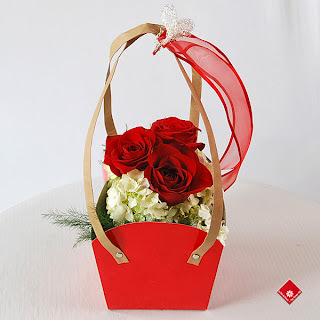 Pinterest is a great source of inspiration for Valentine's day decoration and gift ideas. Have this Love in a Bag sent to your loved one's office so they'll be thinking of you all day! If roses are more your thing, and if you're so romantic you don't wait for Valentine's Day to say "I love you", check out our White Winter Nights arrangement. It's classified as a christmas item but it could be just what you need for your Valentine.